device cast overboard to secure a ship, boat, or other floating object by means of weight, friction, or hooks called flukes. In ancient times an anchor was often merely a large stone, a bag or basket of stones, a bag of sand, or, as with the Egyptians, a lead-weighted log. The Greeks are credited with the first use of iron anchors, while the Romans had metal devices with arms similar to modern anchors. 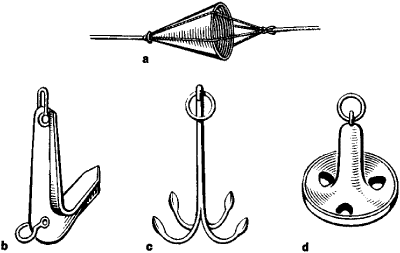 The ordinary modern anchor consists of a shank (the stem, at the top of which is the anchor ring), a stock (the crosspiece at the top of the shank, either fixed or removable), a crown (the bottom portion), and arms, attached near the base of the shank at a right angle to the stock and curving upward to end in flat, triangular flukes. 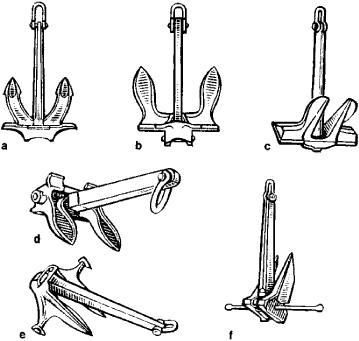 Other types of anchors include the patent anchor, which has either no stock at all or a stock lying in the same plane as the arms; the stream, or stern anchor, lighter than the regular anchor and used in narrow or congested waters where there is no room for the vessel to swing with the tide; and the grapnel, a small four-armed anchor used to recover lost objects. A sea anchor is a wooden or metal framework covered with canvas and weighted at the bottom; it is a temporary device used by disabled ships. Modern ships have several anchors; usually there are two forward and two aft. Formerly made of wrought iron, anchors are now usually made of forged steel. A metal device fastened on the outside of a wall and tied to the end of a rod or metal strap connecting it with an opposite wall, to prevent bulging; often consisting of a fanciful decorative design. a device used to hold a ship or other floating craft in place in an open area of water. Two kinds of anchor are distinguished: ship anchors and special-purpose anchors. An anchor must be strong and easy to handle and must take and hold any ground well. 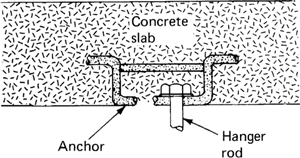 Anchors may be described according to holding power, which is defined as the force that must be applied per unit of anchor weight to pull the anchor out of the ground when its shank is horizontal. The holding power depends on the design and weight of the anchor and on the type of bottom ground. stock comes to rest on the bottom, and one of the flukes digs into the ground. Anchors of this design are reliable and have good holding power (6–12 kilograms-force per 1 kilogram-force of anchor weight). Since, however, the stock and flukes set in mutually perpendicular planes, paying out the admiralty anchor and stowing it are difficult tasks. Use of the admiralty anchor often resulted in accidents involving its own ship or ships passing over the anchor. Naval evolution, particularly the construction of larger ships, required the design of anchors that would be easy to handle and would have greater holding power. Virtually all anchors today are made with pivoting flukes and no stock. The most efficient and, consequently, most widely used anchor designs (Figure 2) were developed by the Englishman Hall, the Americans Baldt and Bayers, and the German Hein, whose design was modified at the request of the German firm Gruson. The anchor designed by the Soviet engineer I. R. Matrosov has given a good account of itself, and the holding power of the American Danforth anchor is rated at 200 or more kilograms-force. The world’s largest anchor, which was built in the United States in 1954, weighs 27.2 tons. Today’s anchors are made of cast or welded steel. 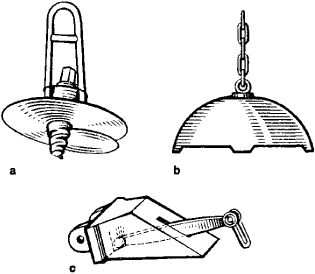 Permanent mooring anchors of various designs (Figure 3) are used for floating beacons, anchor buoys, dredges, and other structures that must be moored for lengthy periods of time. The anchor proposed by the English hydraulic engineer Mitchell is considered the best of this type. simplest sea anchor consists of a canvas cone. Ice anchors, which are used by vessels navigating through ice, usually have one arm and are merely attached to the edge of an ice crack or to the edge of a hole cut in the ice. Special-purpose anchors are extremely varied in design and weight and may have several arms, as does the grapple, or may have none. Skriagin, L. N. Kniga o iakoriakh. Moscow, 1973. What does it mean when you dream about an anchor? Anchors generally convey positive connotations of security, stability, and a harbor against storms. Large bodies of water frequently symbolize the unconscious (or, sometimes, the emotions), making boats vehicles for negotiating the unconscious. Anchors may thus indicate a stable relationship with the unconscious or shelter against the “storms” of the emotions. Loss of an anchor indicates feeling adrift. Less positively, anchors may symbolize a resistance to change or a clinging to a sense of security. As with all dream symbols, the tone and setting of the dream indicate which interpretation is appropriate. A device connecting a structure to a heavy masonry or concrete object to a metal plate or to the ground to hold the structure in place. A tag that indicates either the source or destination of a hyperlink; for example, HTML anchors are used to create links within a document or to another document. A device, such as a metal rod, wire,or strap, for fixing one object to another, such as specially formed metal connectors used to fasten together timbers, masonry, or trusses. An anchor-shaped spicule in the integument of sea cucumbers. An anchor-shaped ossicle in echinoderms. In steam plowing, a vehicle located on the side of the field opposite that of the engine and maintaining the tension on the endless wire by means of a pulley. A device for a piping system that maintains the correct position and direction of the pipes and controls pipe movement occurring as a result of thermal expansion. A device that prevents the movement of sand cores in molds. A device attached by cable to a ship and dropped overboard so that its hooks or flukes engage the bottom and hold the ship at that location. (Or "hyperlink", "button", formerly "span", "region", "extent") An area within the content of a hypertext node (e.g. a web page) which is the source or destination of a link. A source anchor may be a word, phrase, image or the whole node. A destination anchor may be a whole node or some position within the node. A hypertext browser usually displays a source anchor in some distinctive way, e.g. marked with a special symbol or drawn in a different colour, font or style. When the user activates the link (e.g. by clicking on it with the mouse), the browser displays the destination anchor to which the link refers. Some anchors only look different when the mouse is over them but this forces the user to hunt for them when they should be obvious. In HTML, anchors are created with the <a..>..</a> construct. The opening "a" tag of a source anchor has an "href" (hypertext reference) attribute giving the destination in the form of a URL - usually a whole node or "page". E.g. Destination anchors are only used in HTML to name a position within a page using a "name" attribute. E.g. Dream interpretation is very personal and each dream speaks to you in the most intimate way. The anchor symbol could have varying meaning depending on what is going on in your life. It may be saying “Stay put!” or “This is a good place to lay down your anchor.” Dreams involving anchors are hints from your unconscious and may suggest a need to reflect and economize.